This caricature is of Carlton, or The Great Carlton, when he was performing at the Grand Theatre of Varieties, Hanley, during the week of 10 July 1905. He was billed as ‘the Original Comedian, Manipulator of Cards’. 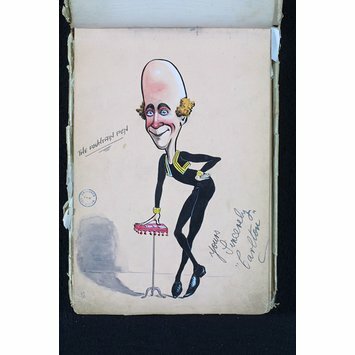 It is one of the many superb caricatures of Edwardian music hall performers that were drawn by the artist George Cooke when he was based at the Grand Theatre. He compiled them in a series of albums. Carlton was on the bill topped by Hardeen, the Handcuff King, another of Cooke’s subjects. Arthur Carlton Philps (1881–1942) specialised in card manipulation and fake hypnotism, with comedy patter. He made his first stage appearance in Newcastle in 1901. Afterwards he became known as ‘The Human Hairpin’ because of his tall, thin appearance. This was accentuated by his elevated shoes, high bald skullcap and black leotard. Also billed as ‘The Champion Card Manipulator’ or ‘The Hanki-Homey Showman’, Philps appeared for a month at the Coliseum Theatre in London in May 1906, at the Palace Theatre and on a Stoll Moss tour. Later in his career, when he was no longer so hairpin-like, he played the Dame in pantomime. Pen, ink and wash caricature on pink paper of The Great Carlton, full-length, standing by a small magician's card table which is covered by a red cloth and fringed with red pom-poms. He is wearing a black close-fitting body leotard and black waistcoat with blue and yellow trimming. He has an egg-shaped bald pate and sprouting sideburns, a red nose and crescent shaped eyebrows. Born in London, Carlton started work as a doorman at the Royal Aquarium, Westminster, but developed his own conjuring act of card manipulation and fake hypnotism. The caricature comes from the second album of caricatures in a collection of albums owned by the Theatre Museum compiled by the graphic artist George Cooke. It is labelled by the artist 'Geo Cooke HYS BOOKE' and features music hall performers working in the early 20th century. 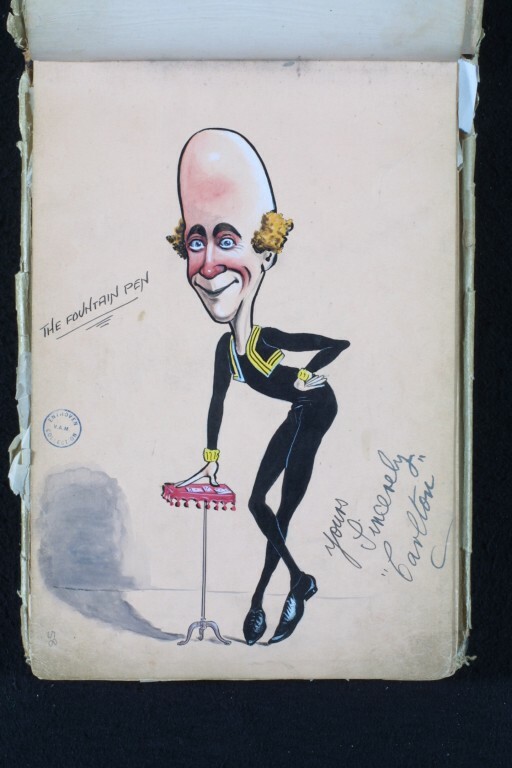 Caricature of the Edwardian music hall performer, the 'comedy card manipulator' Arthur Carlton Philps (1881-1942), known as The Great Carlton, or 'The Human Hairpin', from an album of caricatures drawn by George Cooke. July 1905.